Being a music freak I used to carry earphones almost everywhere while leaving my house because I believe music is the best thing to escape from all the bullshits happening around. But the wacky situation arises when every time I take my earphones out and finds that the wires have entangled badly. It feels like the earphone wires always make a plan to annoy you as soon as you keep them in your bag or pocket. Those five to ten minutes to untangle them used to be the most hectic moments of my life when I desperately wanted to snoop into my playlist but can’t. I am sure most of the people used to experience the same with their tangled earphones. I always wondered whether there will be any inventions which can help washing out this problem once and for all because believe me those moments of unwinding the wires are really irritating. One day while surfing on the internet, I found out that Witworks Company has manufactured what I always waited for. 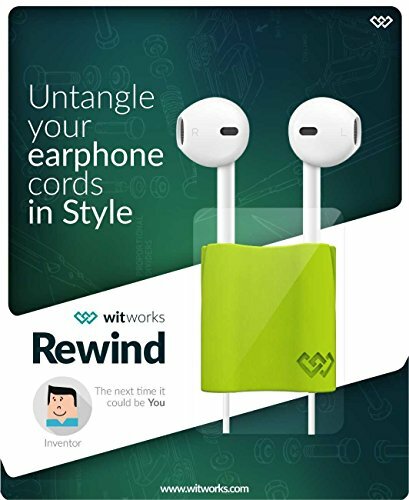 It is the Rewind Limerick Pure Cable Manager Organizer offered by Blink at the Witworks that rooted out my long lasting pain of disentangling the messed up wires of my earphones. This majestic innovation solves many problems that we all face with our earphones. The entangled wires used to damage the sound quality and slowly smash up the whole set. But with this simple Rewind Limerick Pure cable manager, you can not only listen to your favorite music hassle free but can also increase the life of your headphones. The usage of this wonderful innovation is extremely simple. You just need to put the wires of the earphones into the slits of cable manager, pull up until the volume rockers are on the top and just wind the wires around it. When you want to listen to music, just unwind the wires, pull up the volume rockers and let the cable manager remain as it is. The cool designs offered by the company gives the earphones an awesome appearance. It looks like you are carrying some sort of cool music gadget with you. The sleek design of Rewind being compact and lightweight can be plugged in the pocket as well as bags without giving a second thought of getting the earphones damaged. Such an innovation by the Blinks really needs applause because they have made a universal cable solution which not only has a unique design but are also very affordable. Now, forget those days when you have to carry the cases or pouches to keep your earphones safe, forget those days when you had to suffer the frustration of unwinding the wires while others making gawk at you. It’s the era of innovation and Rewind Limerick Pure Cable Organizer has shown its worth in the market. So what are you waiting for, grab the Rewind Limerick Pure Cable Manager Organizer right now and make your life a bit easier. Have access to the link http://amzn.to/2sCDBjl and get this awesome mobile accessory for yourself. It’s the time to finally get rid of the tangled earphones.